After two days of using the HabCam to view the animals in their natural habitat, we moved to viewing the actual animals. 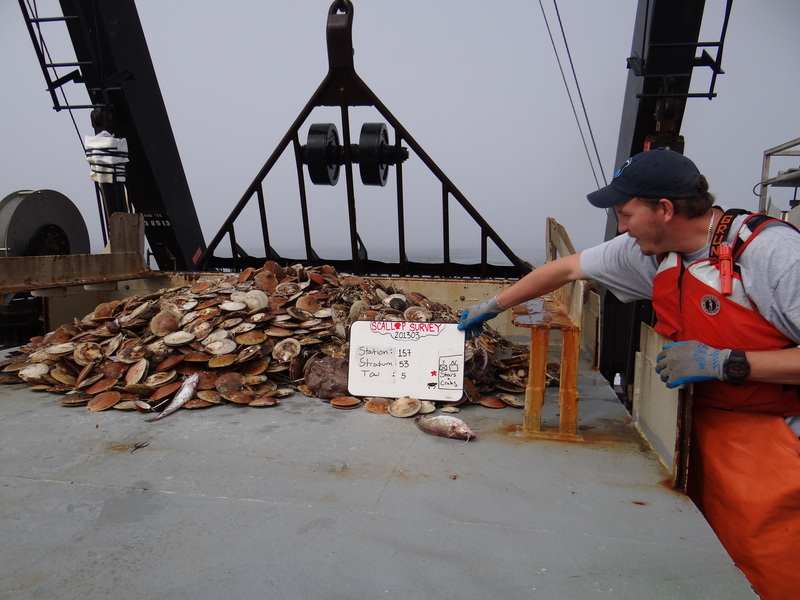 We used a scallop dredge to bring the animals on deck so that we can count and measure them. 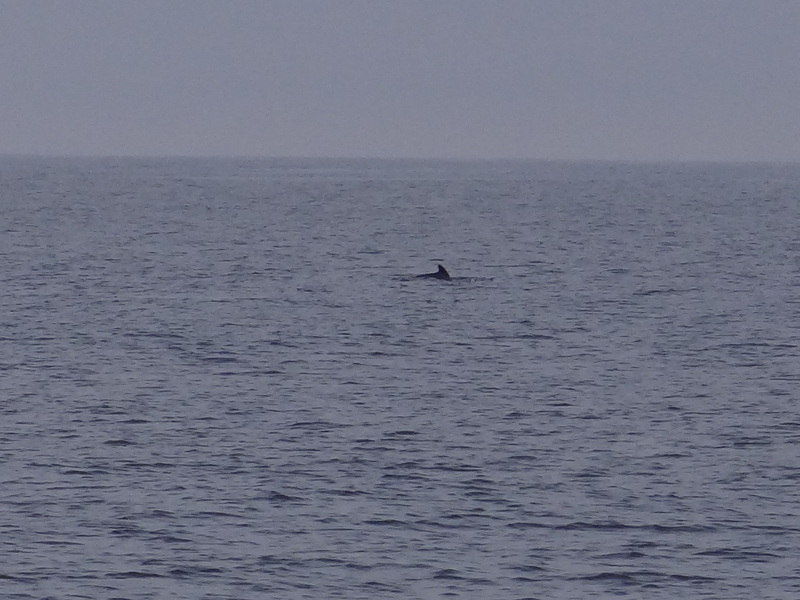 The main goal is to find scallops, but we also sort other animals and measure them as well. In the dredge we have found sand dollars, different types of fish, crabs, sea stars, and of course scallops. The dredge gets pulled behind the ship for 15 minutes. Once the 15 minutes are up, the ship crew will pull the dredge onto the boat and then dump the contents onto the sorting table. Before sorting the contents of the dredge someone from the science crew is responsible for taking a picture of its contents. To keep the pictures separated from dredge to dredge, another person holds a white board that tells the number of the tow in front of each pile before the picture. Then the sorting begins! Sorting the table can be very interesting because the things that come up depend on the location and how deep the water is. At times we sort through scallops and rocks, then the next dredge might be sand, or another time might be mostly sand dollars. 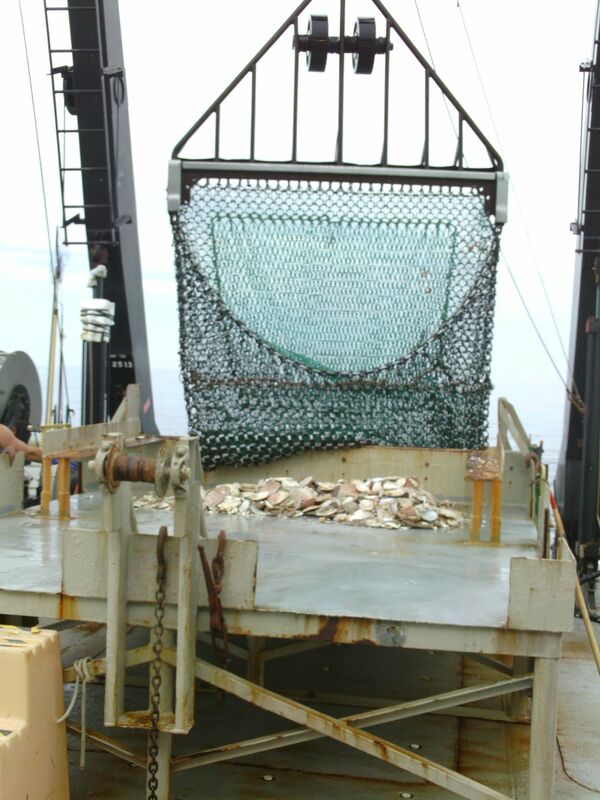 While sorting the dredge contents, we sort all of the fish and skates from the scallops and put the fish and/or skates in a bucket to be sorted later. The items on the table that we are not sampling are considered to be trash. We have to keep up with each time we throw a ‘trash’ bucket overboard because a person on my crew has to count up the total amount of trash. Sometimes we also do a subsample of the number of starfish in the trash and the amount of crabs that came up in the dredge (hermit crabs not included). Crabs and starfish are natural predators of scallops. 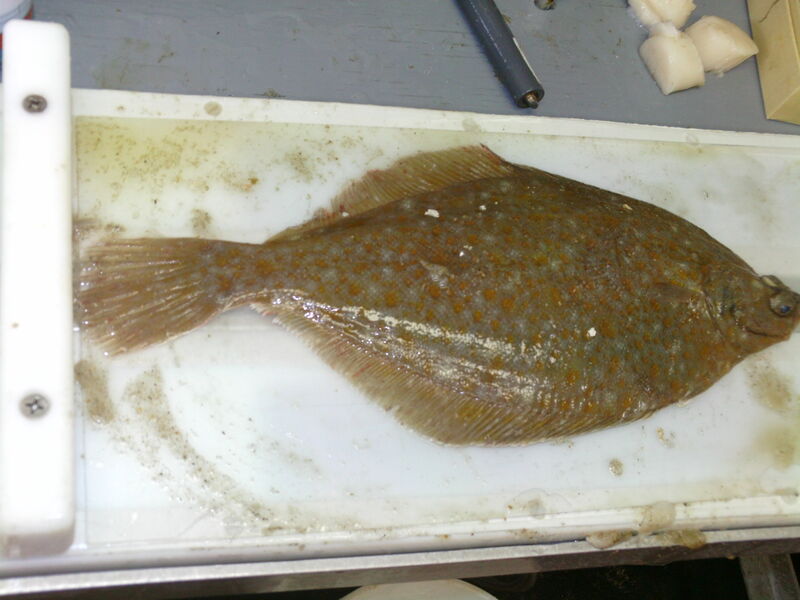 Once the sorting table is clear, we separate the types of fish based on species and then start weighing and measuring in the scientific ‘van’ on the ship. The watch chief takes the weights of everything and then passes it down to be measured by length. Before we can start measuring the length, we have to get the computer ready to receive the measurement data. The names of the people working the station are put into the computer and then the species is selected. To measure the length of an item, we spread it out on a measuring board starting at the beginning of the board. This board is connected to the computer and has a magnet that goes down the length of the ruler that is all the way down the middle of the board. Next, we take a hand-held magnet and press down on the board at the end of the item. The magnet picks up the measurement and sends it to the computer program. This will continue until everything that needs to be measured is complete. Another station in the van is responsible for taking meat weights from a sample group of three to four scallops. The sample scallops first have to be scrubbed down with a wire brush to clean off anything growing on it. After the shell is clean, then the scallops get weighed and measured for length. Then the scallop gets shucked. The gonad gets taken out and weighed and then the muscle gets taken out and weighed. The muscle is the part of the scallop that gets eaten. Then the shells are dried off and bagged up for age testing when the ship gets back to port. It has been foggy here on Georges bank, but work still continues on a ship. 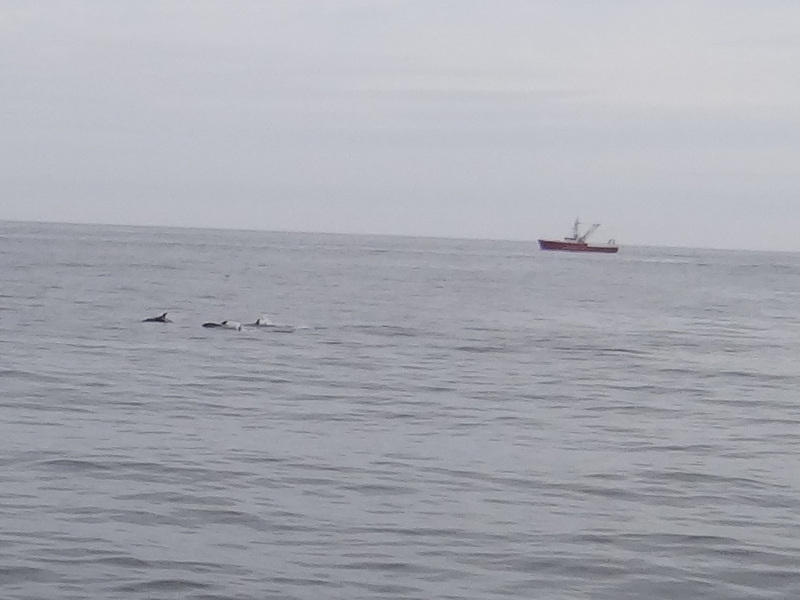 This ship constantly has either the HabCam in the water, or is dredging for scallops and the science crew is responsible for keeping the science research going 24 hours a day. This is the reason for the science crew to be split into two groups. The people in my crew are great to work with and are very helpful! Close to the beginning of one of my shifts, we came across a dredge that was full of scallops. It had at least 10 baskets full of large scallops. 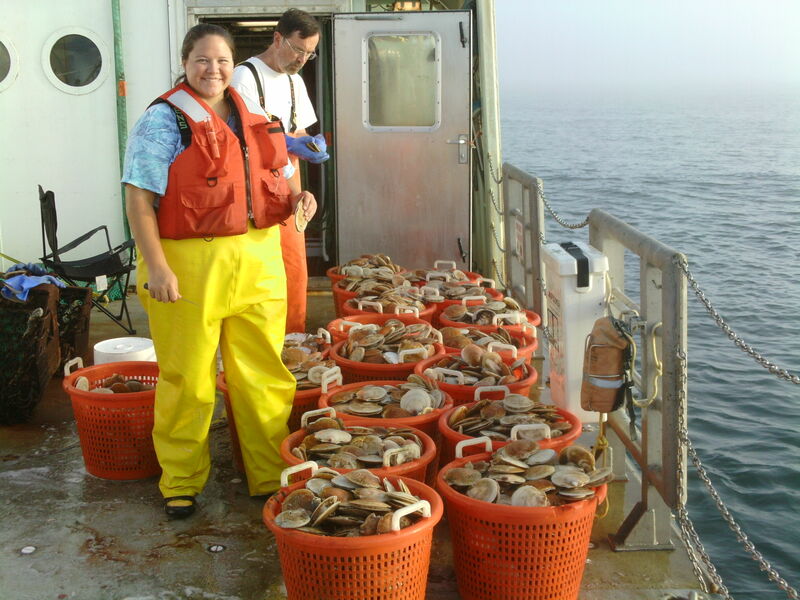 We only measured a subsample of four baskets, but in the subsample alone we had over 400 scallops that were measured in. Then in the very next dredge, we had another dredge that was better than the first one. The baskets of scallops filled up the side of the ship and we were actually searching for baskets to put more scallops in. I have had several ‘firsts’ on this trip. I got my first experience being on a research vessel. This was my first time shucking a scallop. It was also my first time being brought into a fisherman’s tradition. Apparently it’s tradition for all newbie scallop shuckers to shuck their own scallop and then eat it raw. This is not the best tradition in my mind because I have a very easy gag reflex and of course I started gagging, but I was able to keep it down. The cook on the ship taught me how to fillet a fish called whiting. Then as a special treat, he took the fish and fried it up for us to snack on. This was a great treat, because the fish came straight from dredge to be filleted and cooked up to be eaten. It was fresh and delicious! Did You Know… that when dredging for scallops the part of the dredge that drags the bottom of the sea floor will come up looking polished. Look closely at the side of the dredge facing the camera and you will see that it is polished to a silver color because it is dragged over the bottom of the ocean floor. The rest of the dredge that doesn’t touch the ocean floor looks a rusted red color. This lobster was not happy with us! This lobster was full of eggs. 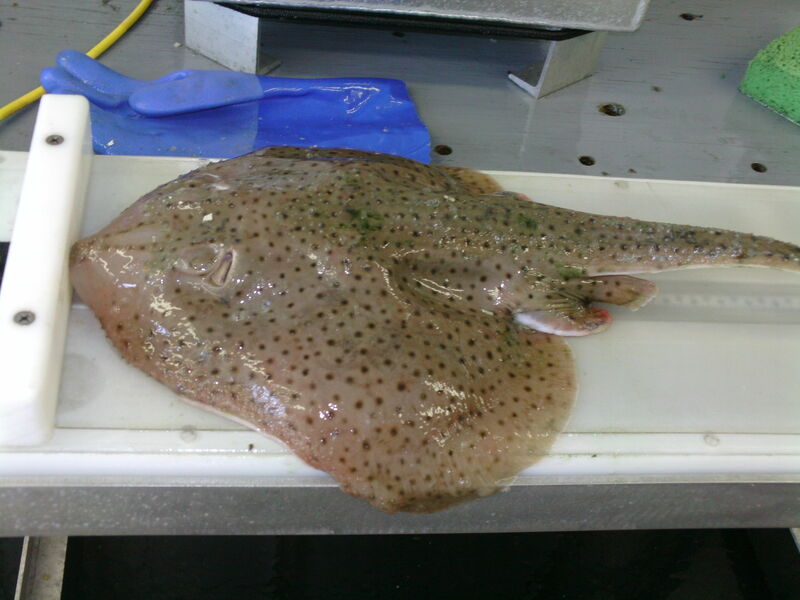 The side view of a monk fish. The dangler is used to attract small fish into the jaws of the monk fish. The inside of a monk fish mouth. The teeth are angled inward to prevent prey from escaping. The fog moves in very quick on Georges Bank. It was so foggy that we almost couldn’t see the sun. It was a pretty end of the day on Georges Bank! The sea gulls even enjoyed the beautiful day! This was the first dredge I helped sort. It was so full and everybody had so much to do! 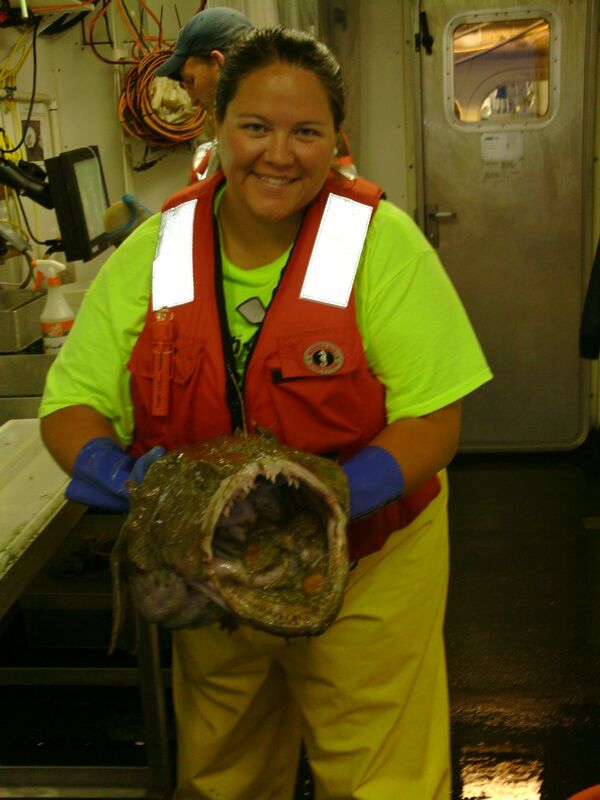 This entry was posted in 2013, NOAA Fisheries Service, NOAA Teacher at Sea, Virginia Warren and tagged lobster, Monk Fish, NOAA, R/V Hugh R. Sharp, scallop dredge, Sea Scallop survey, shucking. Bookmark the permalink.